Chorionic villous sampling (CVS) is a prenatal diagnostic procedure where fetal cells from the placenta are obtained and used to determine whether a fetus’ chromosomes are normal or whether there is a chromosome abnormality present. In specific inherited genetic disorders such as cystic fibrosis, muscular dystrophy, fragile X and haemophilia, or biochemical disorders, specific gene testing can be done. Chorionic villi are small finger like projections that make up part of the early placenta. Cells of the chorionic villi almost always have the same chromosomes as the fetus. Hence, fetal chromosome abnormalities should be reflected in the chorionic villi in the placental tissue sampled. The CVS specimen is sent to a pathology department, where a specialised medical scientist, or cytogeneticist, will culture (grow the cells) and then examine the cells through a microscope. It is a very labour-intensive procedure that takes an average of 10-14 days to arrive at a final or long term culture result. A special specific gene test may be sent to a central laboratory in Brisbane or sometimes interstate and usually takes several more weeks. A more rapid but less comprehensive result is sometimes possible after 48 hours, and is called a “short term CVS result”. Sometimes a “FISH” (fluorescent in-situ hybridization) test is done. The FISH test provides a preliminary result looking at the five most common chromosome abnormalities with 24-48 hours of testing. The pathology laboratory determines the choice of which “short term” test is performed. This quicker result is an additional test on the same specimen with an additional charge, but does not exclude all chromosomal abnormalities. Sometimes when a specific abnormality is suspected, it can be beneficial in expediting certain obstetric management decisions. A screening test such as the 12-week nuchal translucency scan or NIPT has resulted in a “high risk”. There has been a previous pregnancy affected by a chromosome abnormality or inherited genetic disorder. There is a known inherited genetic disorder in the family of either the mother or father of the fetus. The decision to have a CVS is often a difficult and stressful one to make. It is important that the patient and her partner have fully discussed the issues prior to having the procedure done. They should discuss this amongst themselves and with their doctor. The decision to request such a test as CVS should only be made when the couple feels fully informed and understand what is involved. Is testing the right thing for you? Not all abnormalities can be diagnosed with CVS. Only chromosome abnormalities and, when specifically tested for certain genetic disorders, can be diagnosed. Hence, if the chromosome result is normal, this does not guarantee a normal baby. It does, however, exclude major chromosomal abnormalities in the fetus. Results of CVS are very accurate but occasionally the results can be very difficult to interpret. In such circumstances further chromosome testing may be required. CVS is most commonly performed to determine whether or not the fetus has Down syndrome or another major chromosomal abnormality present. Occasionally, a rare chromosome abnormality may be found. This will usually best be explained to you by a geneticist who is a specialist doctor. The accuracy of a specific test will depend on the specific inherited genetic disorder and will be discussed by the genetic counsellor or your doctor. In about 1 in 1,000 CVS procedures, the placental cells fail to grow. This is not due to a failure of the needle test or pathology laboratory. Rather, it is just a fact that some placental chorionic villi fail to grow outside the body in the special laboratory environment. If this does occur, it does not mean that there is a problem with the fetus. A repeat CVS or amniocentesis may need to be performed. Placental cells collected at CVS or fetal cells at amniocentesis may display “mosaicism.” This occurs when the fetus has two “cell lines”. That is, one cell line contains normal cells in one culture and the other may contain abnormal cells in the other culture. If different cell lines are present in the CVS sample, the CVS result is inconclusive, and your doctor may order amniocentesis. The maternal cells may contaminate the chorionic villi and give an incorrect or ‘maternal cell contamination” result. Laboratory staff are skilled to differentiate between adult and fetal cells, so this is rarely a problem. CVS is always done after 11 weeks to prevent limb abnormalities that have been seen when CVS was performed before 9 weeks in the past. Most CVS results will be normal. However, if the CVS result is abnormal, the patient may require further information and counselling. SO+GI’s genetic counsellors are here to help you and are available for further counselling and will liaise directly with your doctor. If you have had prenatal testing performed at another practice, our genetic counsellors are still available for consultation. The skin is cleaned with antiseptic solution and a sterile drape will be placed on the mother’s abdomen. Under constant ultrasound guidance local anaesthetic is placed into the skin. (You must tell the radiologist doing the CVS if you are allergic to local anaesthetics or antiseptics before the procedure). 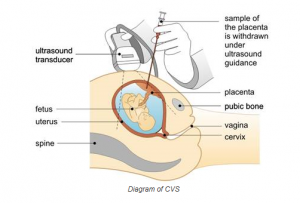 Under constant ultrasound guidance, a CVS needle is then passed through the abdomen and the uterus into the placenta. The sharp stilette is then removed and a syringe is then placed on the end of the needle. The needle is then passed up and down several times in the placenta to obtain the chorionic villi specimen. Sometimes due to early gestation, placental location or uterine position, it is not possible or may be technically too difficult to perform a CVS. The radiologist may request to see you again in a week or two or recommend that instead of CVS you have an amniocentesis at 16 weeks. During a CVS most women feel some discomfort. It is usually not a painful procedure. Often the stress and anxiety in the days before the CVS are said to be the worst thing about the test by many patients. After the CVS, if the maternal blood group is negative, Anti-D is required within 72 hours. This will prevent the mother developing antibodies to the baby’s blood cells should the baby be blood group positive. Patients who have had a CVS are advised to take it easy for 24-48 hours. They are advised not to do any strenuous exercise or activity such as lifting or housework or picking up young children. Some cramping for several days for which panadol may be taken (avoid aspirin as this can be associated with bleeding by thinning the blood). Some vaginal spotting of small amounts of bright red blood (It is not normal to have a lot of bleeding and you must contact your doctor immediately if this happens.). Signs of infection such as a fever or high temperature, sweats, chills, feeling unwell or a flu like illness. Miscarriage will occur in 1:100 or 1 % of CVS procedures performed. There usually is no specific reason for this. The procedure is relatively straightforward although it does require proper training and experience and should only be done by experts who regularly perform CVS. If miscarriage occurs, it will usually do so within two weeks of the CVS. There is a background risk of miscarriage in the first trimester in patients who have not undergone CVS. It is not an infrequent occurrence and occurs in 12-15% of all recognised pregnancies.